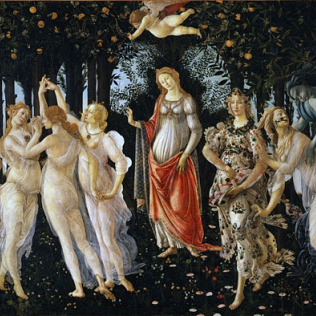 Along with the Birth of Venus, Botticelli\'s Primavera is undoubtedly the most famous Uffizi Gallery painting. In the painting there are nine characters, more or less aligned in the foreground. Two men, six women, one of which is in a central position and slightly set back respect to the others: above her, a winged putto is flying. Figures are elegant and harmonious. They are located in a garden, surrounded by a grove. In the depiction of plants and turf, Botticelli creates a masterpiece of precision, representing over 190 different types of plants, chosen from among those that bloom in the Florentine countryside between March and May. The interpretation of the work is complex and mysterious. It seems to contain a coded language that only those who belonged to the inner circle of humanist intellectuals of that time were able to understand. The literary, philosophical and iconography references are numerous and complicated: they are linked to the neo-Platonic philosophy, and to the humanistic and Latin literature most widely read at the time. So, different interpretations have been given. According to the more traditional one, the painting is to be \"read\" from the right to the left. Through myth, moral truths are shown. The scene is set in the garden of the Hesperides, where the golden apples of immortality grow. The first character on the right is Zephyrus - the wind that accompanies the arrival of Spring - represented while he is kidnapping the nymph Chloris, from whose mouth flowers come out. After their union, the nymph becomes the goddess Flora, protectress of agricultural jobs and female fertility. Thanks to the mediation of Venus - the goddess at the center of the painting – the physical and irrational love of Zephyrus and Chloris elevates and perfects itself. Therefore we meet the three Graces, traditional representatives of liberality: Cupid\'s arrow, in fact, is addressed to them. On the left, finally, there\'s Mercury. He pledged to drive away the clouds from the sky, to defend the garden perfection. Thanks to him the love gets a further rise, to the celestial spheres. This interpretation is closely related to the Platonic Academy of Careggi. However, over time art historians have proposed others: historical, allegorical or literary. In short, still today we admire this masterpiece and we try to interpret it, conscious that we will never be able to totally solve the mystery that surrounds it.